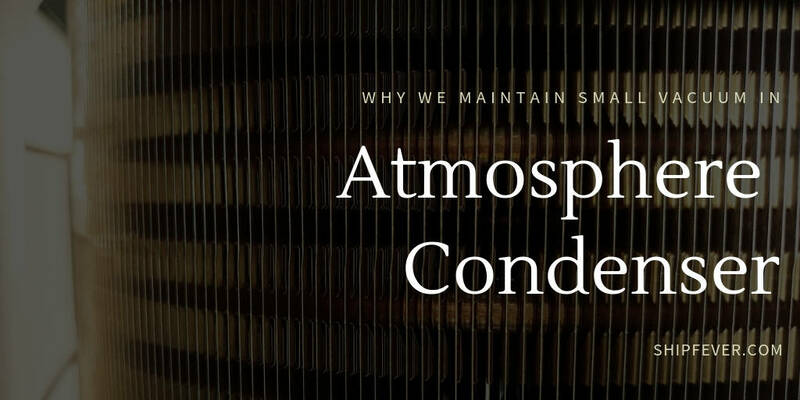 ShipFever > miscellaneous > Why We Maintain Small Vacuum In Atmosphere Condenser ? For those who already know what a condenser is and what does it do; have you wondered why some of them work under vacuum while others not ? A condenser is a type of heat exchange; used to exchange heats between two fluids to condense steam or gas mixture. A condenser is used mainly with boilers or other gas system such as in refrigeration system. It basically takes out the latent heat of vaporization; from the gas mixture whether be steam or gas refrigerant to covert it back to liquid. Condenser that works under vacuum such as in boilers are called vacuum condenser; while the others working under normal or low vacuum condition are called atmosphere condenser. An atmosphere condenser is used for extracting heat out of refrigerant; as in refrigerators and air conditioners. Furthermore they are also being used; for extracting water directly out of the atmosphere. The assembly consists of an air pump, membrane model and two sets of atmosphere condenser. The air is supplied to the atmosphere condenser through a blower and membrane module; a vacuum pump take suction from the module while the operation and send output to the other atmosphere condenser. The first condenser output is then a cool dried air while the other one give portable water. Thus an atmosphere condenser is nothing but an air cooled condenser with fins attached; to successfully radiate heat out of the system. It is also used in power plant and boiler system in areas with water scarcity. Why Vacuum is Maintained in Most Condenser ? Not all condensers maintain vacuum but certainly all working in boiler system do. In any form of boiler system whether on board ship or in power plants; water is used to condense steam back to liquid water. Now since water and steam has an volume ratio of 1:1600; that means steam condense to the size of 1/1600 times than before. One such action of sudden decrease in volume leads up to creation of partial vacuum by itself; sucking in the steam before them into condenser. Now since the high pressure steam already loose almost all of its; kinetic and pressure energy by the time it exit’s the turbine. Now to ensure proper and continues flow of steam to condensers at all times; external vacuum pump and air election system are installed to steam line the whole process. Furthermore if you know about the Rankine cycle and how it works; its not hard to see how creating constant vacuum condition helps recover some waste energy in the process. For those who don’t know what Rankine cycle is and what are its application; Its basically a temperature vs entropy graph used to predict the performance of a steam system. It works on the principle of heat engine; converting heat in the medium to useful work upon phase change. Under normal condition the entire thermodynamic process follow the path from 1-2-3-4-1; with the inside area representing work done say “initial work”. 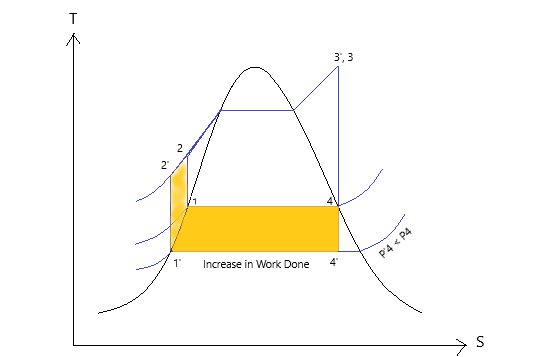 Now as the pressure is decreased the same process follows a new path from 1′-2′-3′-4′-1′; with the new work done area say “final work”. Now the net work done i.e final work – initial work is always net positive; and thus results in more work done for the same steam. What Will Happen If Vacuum Is Increase Or Removed ? While lowering the working pressure of a condenser do have many benefits like; faster condensation, better heat exchange, avoid air to get dissolved in water and increased overall efficiency of the unit. But there is a limit to which it is feasible and when it starts to make more trouble than it solves. Basically it becomes harder and harder to maintain perfect sealing condition in a condenser as the pressure reduce below 1 atmosphere. This increase on the cost and maintenance requirement making it ineffective in long run. Furthermore as we reduce the pressure; the steam starts to condense at lower and lower temperature. Now as the temperature of condensing steam decrease with decrease in pressure; various challenge arise to maintain the same heat exchange between the medium. Ideally greater is the temperature difference between the two medium; better is the heat exchange efficiency of the condenser. Similarly if we remove the vacuum from the system it not only increase the amount of heat energy lost unused; but also cause a rapid drop in P.h of the boiler water. Furthermore this lead to a situation where; it creates uneven transfer of steam towards condenser generating back pressure. This back pressure will then generate an retarding force on to the turbine blades; reducing their overall rpm with heavy vibration and stress. In short run it will leads to sudden drop in system efficiency; while in long run it leads to complete damage of the turbine assembly. So a condenser is never run without vacuum unless it is intended to and safe. Are Air And Atmosphere Condenser The Same ? An atmosphere condenser is the one which works under normal atmospheric condition; basically without vacuum condition. It can be both air and water cooled type; as long as they are not used with dedicated vacuum pump. On other hand an air cooled or air condenser is a system of tubes with fins attached. It use these attached fins to cool and condense stream or refrigerant with the blow of air. The air condenser are the one installed in your car refrigeration system; air conditioner and home based refrigerator. Other than that they are also used in many installation in dry area; as the difference between wet and dry bulb temperature become almost obsolete. 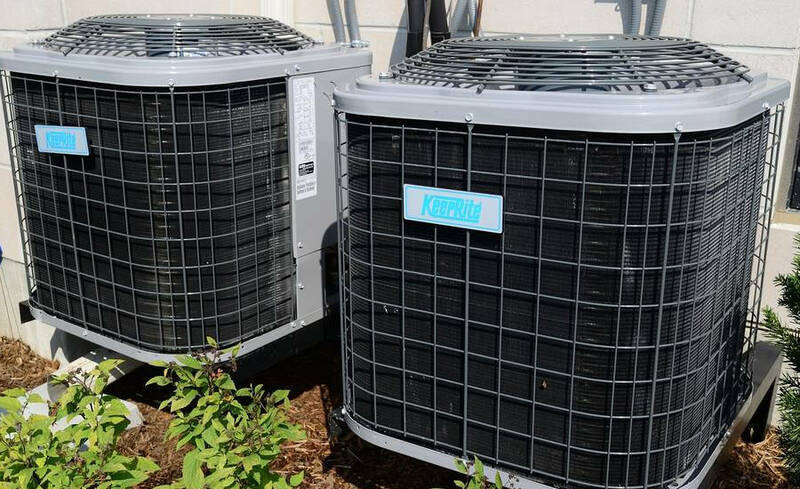 In a typical refrigeration and air conditioning system; the air condenser unit is kept outside; so as the heat is transferred to the surrounding air. Such an air condenser which use free blowing air for the process are called natural convection type; while the one using a fan to assist is called forced convection type. The whole process took place based on the second law of thermodynamics under atmospheric pressure. So while all air condenser can be called atmosphere condenser; not all atmosphere condenser can be called air condenser. The atmosphere condenser which is used for generating water; use the refrigeration system to produce water in most case. The only difference there is that; instead of wasting the water output it is then send to a filter to make it drinkable. Why Do Most Condenser Tubes Have Horizontal Arrangement ? A condenser is basically the heat exchanger of plate, shell and tube types. While most plate heat exchanger are mounted vertically; shell and tube type heat exchanger are mounted horizontally. These different arrangement of tubes tubes and plates in different condenser types; is done to achieve satisfactory performance in all condition. A shell and tube heat exchanger consists of two major parts; a large spherical shell casing and tubes passing from side to side. Similarly a plate type exchanger is build of identical thin plates; made of titanium or stainless steel. I have already written in details about different types of heat exchange; their types and working principle in one of my old post. Heat is transferred from one flowing medium to another when they came under direct or indirect contact. When heat is transferred through an indirect contact; highest possible efficiency is achieved when they follow a counter concurrent flow. Now if the system is installed with vertically mounted tubes; it will lead to higher pressure drop across the inlet and outlet points. A vertically tubes structure also mount the challenge to clean effectively and maintain even heat exchange from top to bottom. As due to the effect of gravity on lower part of tubes; it is required to increase its width as it moves downward to maintain its integrity and strength. Any such arrangement will results in poor heat transfer coefficient; and thus are avoided over most effective horizontal tube design. Our A.C condensers are made of tubes fitted with thin fin structure for efficient heat transfer. The gap between these fins are many a times small and get clogged by the dust particles. If we do not clean and does not care about its condition; sooner or latter it will leads to reduced performance of your a.c unit. When sufficient amount of dust and particles stick to the fins; it start to act as an blanket between the fins and the air. This then results in reduced heat transfer between the hot refrigerant and the atmosphere. Thus it is required to clean off the dusts from your a.c evaporator and condenser coils on a one to one basis. You can easily clean off the dust using a spray of water using your garden hose. Just set the water pressure using the nozzle selector; and then spray a light jet of water on to the condenser fins. I personally use the flexible hose with multi nozzle type for the purpose; click the link over here to check its current price on amazon. Now still with regular cleaning it degrade overtime with leaks in the condenser tubes. Many a times with manual cleaning using brush; we apply such force that it bend the fins for bad. Moreover flushing condenser over time makes it prone to damage by the abrasive particles; with a problem of clogged condenser drain. So if you find the need to refill refrigerant too often in your system, condenser got damaged or its too dirty to be cleaned; its now time to replace complete condenser assembly with an new one. Note: This article is produced on Request From “AVINASH DEEPAK“. Welcome ! ; But No need as Its my work to Produce article on request.